Ouch! I have a small local client who received one of these messages. Frankly, it weighed on me heavily because undoing the damage of the previous SEO was going to take months worth of work. Could I really get these links removed? 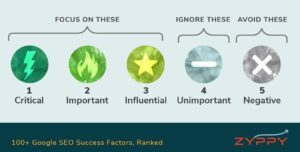 Most seemed to exist on splogs (spam blogs) and websites with auto-generated spun content. Usually there is no contact information and it looks like the chance for removal is nil. With the Google Webspam team setting super-human requirements for link removal, was I ever going to succeed? Fortunately, a number of tools have popped up over the past couple of months to assist time-strapped webmasters in atoning for their Google sins. Not only do the services help you to identify which links to remove, they also assist in finding contact information, sending out emails, and tracking your efforts in spreadsheet form. Wow! We didn’t even know 60 posts existed on this site – we had only written this webmaster about a single link. Here are 4 tools to help webmasters find and remove bad backlinks. Allows you to enter your target URLs, then rmoov takes your target URLs, helps to identify contacts, creates and sends email, follows up with reminders and reports on results. How do you find the bad links pointing at your site? 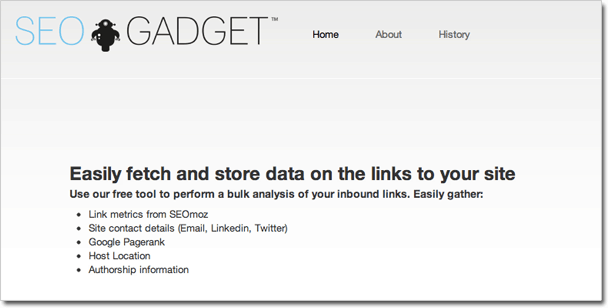 This tool from SEOGadget gathers link information from SEOmoz, then runs it through their special algorithms to score each link as “safe” or not. The best way to use this tool is to download your links from Google Webmaster tools, and upload them 200 at a time into the tool. SEOGadget then tells you the anchor text, gathers link metrics, and will try to find email and contact information for each link. One of the most robust solutions, Remove’em combines suspicious link discovery with comprehensive email and tracking tools. It’s the most expensive of the tools on this list, but it also draws from the most data sources and automates and combines many tasks. Try out the “predict” function at the bottom of the homepage to see how many bad links it discovers pointing towards your domain. This odd service let’s you check if you have any links in their spam link network. 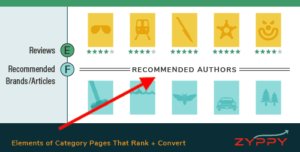 If links are found, it then offers one click removal, for a cost. Ian Lurie pointed out that not only do they offer to remove links from their link network, but they have an affiliate link to the same network in the footer of their site! What are your favorite tools to identify and remove backlinks? Let us know in the comments below. Like this post? Vote for it on Inbound.org! I got hit by toxuc backlink from unknown source and my ranking fall down. I want to buy paid toxuc backlink remover my budget arround 20-30$ / month. Wow, but how accurate is this? Or better yet, is there a way to do this in reverse? Instead of scanning your own website, is there a way to scan the website you suspect it a bad link? Why did you stopped writing articles?? I have one question… But the DeleteBacklinks.com don’t work? Why? And the best solution? Same deal. I went to it and it’s just a white page. Did they shut it down? Google is getting much more fussy. They are in many cases complaining about links today that two years ago would have been fine. In fact, I just helped a client recover from a major manual action. Our client had done some of their own link building back in 2013 and Google didn’t like those links. But after we cleaned those up Google kept coming back pointing to links that weren’t really that bad. We decided to push back on Google and point out that the links they had provided as examples of links that violated their webmaster guidelines actually did not because they were the result of a legitimate outreach program to get bloggers to review the client’s product. The problem was that some bloggers were overzealous and linked like crazy to the client’s site within their review. One review had the same three word exact match money keyword phrase repeated five times in anchor text! Certainly looked bad. But that was how the blogger chose to review the client’s product so we told Google that the link was good and that it did not violate their guidelines since we did not instruct the reviewer to link to the site. They lifted the penalty after that and the client’s rankings returned to just about the same rankings they had before the penalty. The reason we were able to maintain the client’s rankings is that we were very careful to only remove links that were clearly questionable and pushed back on Google when we felt that their request for additional removals was not valid. Couldn’t some just use one of these services to remove (legitimate) links pointing to your competitors’ site? Thanks for the information. Our website is recently get this warning and it took days to spot the first unwanted inbound link. This tool will be very useful. Thanks Cyrus! Good post, Cyrus. Currently using Remove em for a site and it’s been working well. They don’t have all the contact info, but a decent amount. Going to cross reference with Tools 1 and 2 when done now that I know about them (thanks for posting). The sad part is that some webmasters are trying to capitalize on this and charging to remove the links. I think a small fee is fair, but one guy wanted to charge $250 to remove one link. I think that’s a bit much. Thanks Cyrus for showing me these tools. I did this all manually for a good portion and this could have saved me a TON of time. If you find any contact information for a website, either via a contact form, email address or WHOIS information, you can send an email and report that you made an attempt to the Webspam team. In cases where there is absolutely no way to contact a site, you need to report these to the Webspam team as well. I would say from a product perspective Remoove’em is the best but i’ve tested some sites that got hit by recent penguin/panda updates and it flags it as a clean link profile. Also found that one or two larger sites with a clean link profile gets flagged as having a lot of links that should be removed, it’s too inconsistent but will try it on one live site soon and see what is the impact. Hi Cyrus, have you used all of these services? Are they all legit? Legit all the way. I’ve used the 1-3, and they are all the real deal. Fortunately, I haven’t had to use DeleteBacklinks.com, but I have no reason to doubt they do what they say they do. Keep in mind, these tools help you discover bad links and send email, but it’s up to the webmasters to actually delete the links. 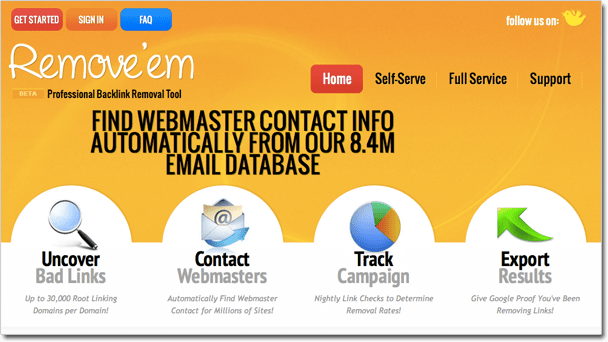 These tools make it much, much easier, and both rmoov and Remoove’em have composed high converting email templates that help get the job done. If you want to see a demonstration, send us a site or two that has backlinks in our network of affiliate sites (just search from our home page). We’ll let you see our service in action at no charge. Thanks so much for the mention – it’s really good to hear some “good news” on the link removal front! I know that everyone here at rmoov loves that our tool can make a bad situation better & I’m sure it’s the same for the teams at Virante & SEOgadget too. Really pleased that you included that awesome message from a site owner who has gone above and beyond! I have to say it has amazed me how many similar messages I have received while using rmoov to manage client campaigns. I love that sometimes the glass half empty people are proven flat out wrong by some good old fashioned human kindness! I’m so happy to say that the responses like this one far outnumber any negative or grumpy replies I have seen. Makes me proud to be part of this big ol’ crazy world wide web!